Take a sneak peak at an all-new Halo 4 Custom Game from Pete the Duck! This action packed custom game pits Rail Gun against Mantis in a frantic battle. Rail shots fill the sky as Mantis air-drop on to the battlefield. I put this trailer together from a recent playtest session, so there might be some changes by the time the final version is released. It’s already a total blast. See for yourself! Both the Onslaught map and gametype are available from Pete the Duck’s Halo 4 File Share. For more news and updates, stay tuned here at CruelLEGACEY Productions or visit www.petetheduck.com. 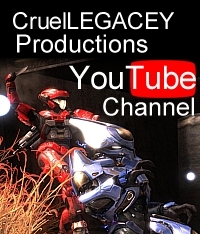 Video | This entry was posted in Forge, Halo 4, Video and tagged custom game, halo 4, onslaught, pete the duck. Bookmark the permalink.